B u s i n e s s I n s i g h t M T D D e c e m b e r 2 0 1 8 80 back to proper staffing at the proper skill levels. If anything, the next 10 years will be exciting in this regard. Let's also not forget many states, and some global companies', decision to move minimum wages to close or to $15 an hour. If you have two employees, one making $18 an hour (flat rate or hourly, doesn't matter) and the other making $11, and that $11/hr. jumps to $15, do we all really think the $18/hr. person won't want to maintain the distance in wage earnings? ankfully, this change is likely to evolve more than snap into place, but for the states it hits first, it will be interesting to see how everything ends up being affected. For now, we can only use wage theories and history to predict how the markets will react, but they ultimately are just theories and reality oen can throw a curve ball and the results come out differently (which creates new theories). To 2019, I say: Bring it. Low unem- ployment is likely to continue, and while that makes staffing harder, it means more people are driving to work and putting miles on their cars. 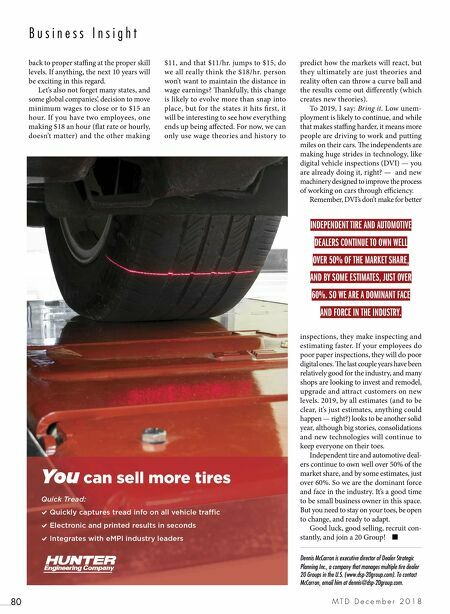 e independents are making huge strides in technology, like digital vehicle inspections (DVI) — you are already doing it, right? — and new machinery designed to improve the process of working on cars through efficiency. Remember, DVI's don't make for better inspections, they make inspecting and estimating faster. If your employees do poor paper inspections, they will do poor digital ones. e last couple years have been relatively good for the industry, and many shops are looking to invest and remodel, upgrade and attract customers on new levels. 2019, by all estimates (and to be clear, it's just estimates, anything could happen — right?) looks to be another solid year, although big stories, consolidations and new technologies will continue to keep everyone on their toes. 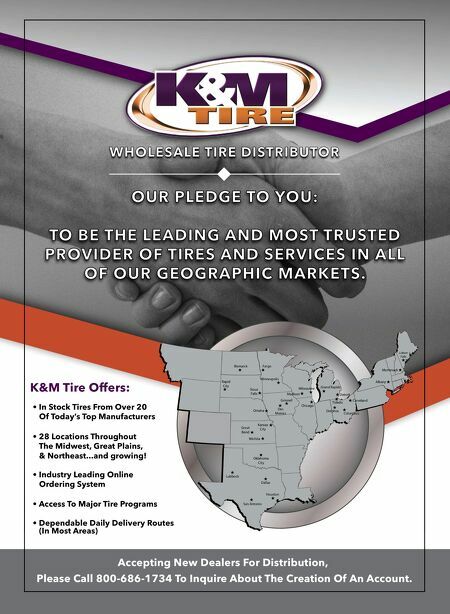 Independent tire and automotive deal- ers continue to own well over 50% of the market share, and by some estimates, just over 60%. So we are the dominant force and face in the industry. It's a good time to be small business owner in this space. But you need to stay on your toes, be open to change, and ready to adapt. Good luck, good selling, recruit con- stantly, and join a 20 Group! ■ Dennis McCarron is executive director of Dealer Strategic Planning Inc., a company that manages multiple tire dealer 20 Groups in the U.S. (www.dsp-20group.com). To contact McCarron, email him at dennis@dsp-20group.com. INDEPENDENT TIRE AND AUTOMOTIVE DEALERS CONTINUE TO OWN WELL OVER 50% OF THE MARKET SHARE, AND BY SOME ESTIMATES, JUST OVER 60%. SO WE ARE A DOMINANT FACE AND FORCE IN THE INDUSTRY.